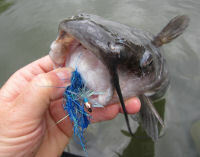 I don’t know about you, but catfish are not one of the ‘premier’ fish on my bucket list….but let’s just say that if they were on my list….I can now cross them off. I got a call from my buddy Frank with an invitation to a new lake that he had secured permission for us to fish in. We met at 3pm….a few minutes after school was over and by 3:30 we were sitting on a 7 acre lake not too far away and I must say it was one beautiful piece of water. As we drove in Frank told me that the last time they were here they caught lots of catfish….but I was in bass mode and knowing I was using a fly rod….well, catfish didn’t even cross my mind; that is until the first big hit I took on my Civil War Streamer and the big fish on the other end starting rolling me. I have to admit at first I thought I had a big bass but when the fish surfaced I could see it was clearly a catfish. I had to be patient as I had 4x tippet on my 5 weight rod with type 3 sinking line but in about a minute I had the fish in my float tube. I took a few pictures and then tried to extract my streamer and in doing so this fish of 22 inches bit down hard on my thumb…no joke, it was very painful and left a skinned area! The next hour was more of the same as I caught 3 more catfish with some bass in between for good order. I then switched to my 2 weight rod and a white bunny tail streamer to concentrate on bass….and you guessed it, I caught yet another 20 plus inch catfish. The highlight of the night came moments later as I was casting the white streamer….stripping a couple times then allowing it to sink naturally. I casted towards a cattail area made two quick strips and waited when from below an 18 inch bass in the 4 to 5 pound range inhaled the streamer and the fight was on. My small reel on my 2 weight is a right hand retrieve and thus I just stripped the fish and fought it by hand and without much ado I had the bass landed in about 30 seconds. It capped off what was a great night of fly fishing…several catfish, all in excess of 20 inches, an 18 inch bass, a 16 inch bass and several others in the 14 inch range…and all less than 20 minutes from home!